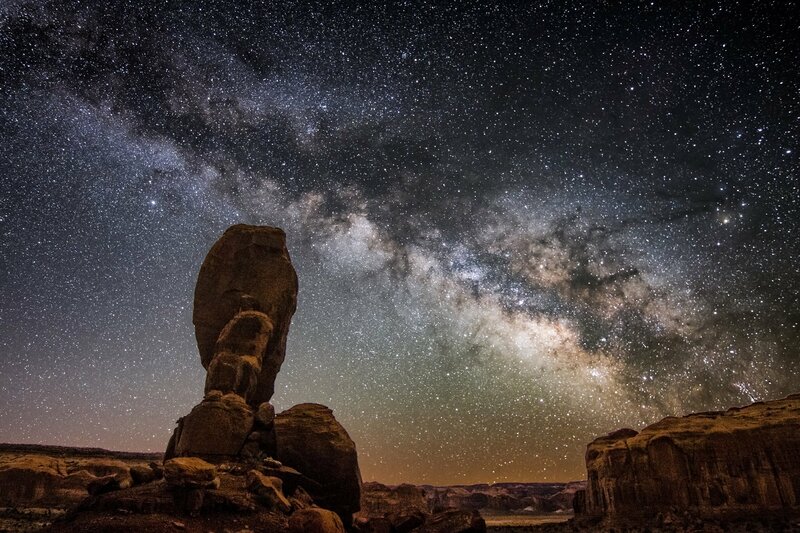 This image of the Milky Way over Monument Valley was taken by Dale Boan, a friend of Scott’s. It’s a composite-photograph taken of the Milky Way and local geography in the predawn hours from the Arizona-Utah border’s Monument Valley. The details provided by Dale on how this great shot was taken are included below the image. Dale gave us permission to post this image. Thanks for passing this along Scott. The final image is a composite of a single tracked sky and an un-tracked foreground. He used a Canon 7Dm2, ISO 800, f2.8, 3 minutes exposure using a Tokina 11-20mm f2.8 at 13mm. Tracking was with an iOptron skytracker. Dale tells us that the foreground image required more processing then the sky!